This recipe turns an ordinary chicken breast into a tangy, sweet, and savory oasis for your taste buds. The chicken is sink-your-teeth-into-it tender, and the Tequila Lime Honey Glaze with the honeycomb is so delicious, you’ll just want to drag your chicken through it. Oh, and the bacon… well, that’s like cheating when it comes to cooking. You just can’t go wrong with bacon. To create this masterful melt-in-your-mouth main course chicken dinner, I just combined a few of our family’s favorites. 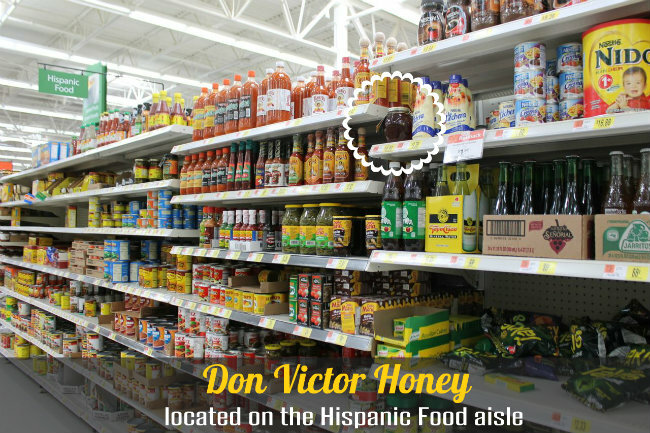 Something to keep in mind when shopping for Don Victor honey, it’s located in the Hispanic Food aisle at Walmart, and can not be found alongside honey elsewhere in the store. Our family loves the honeycomb that is included in every jar of Don Victor honey. This shop was previously compensated by Collective Bias, Inc. and its advertiser. All opinions are mine alone. #HoneyForHolidays #DonVictor #CollectiveBias. Step 1 – Preheat Oven to 400 degrees. I use a convection oven so it automatically adjusts downward by 25 degrees. Once it’s heated it shows 375 degrees. I poured 1 tablespoon of cooking oil into my glass baking dish to prevent the bacon from sticking. Step 2 – Prepare. 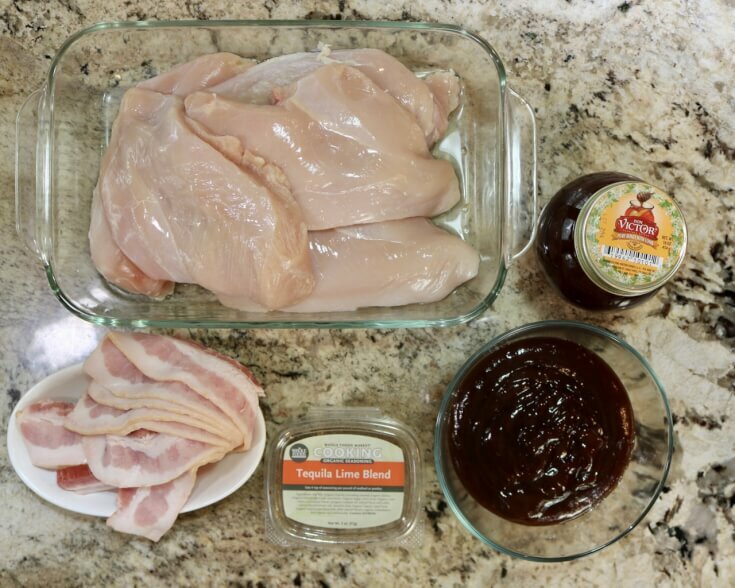 Trim all fat off the chicken breasts and cut the breast into two pieces longways. It makes for the longest split down the center of the breast. Step 3 – Soak. Coat chicken breasts in BBQ sauce. Step 4 – Season. 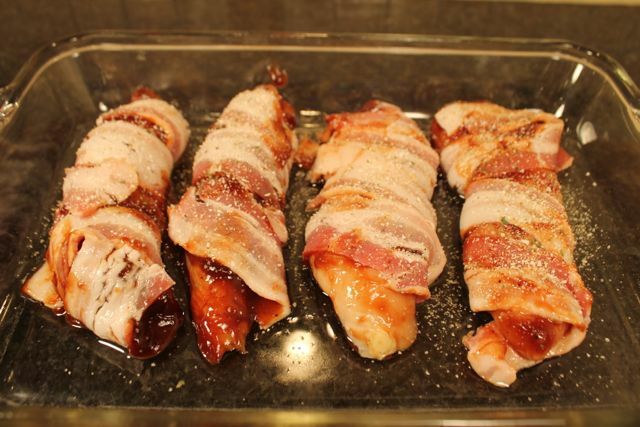 Wrap up to two slices of bacon around each chicken breast half. Sprinkle wrapped chicken breasts with garlic salt. By slathering on the BBQ sauce and wrapping it in bacon you are creating a seal around the chicken that will ensure it doesn’t dry out. Just to be sure you get extra tender, juicy chicken, wrap a piece of aluminum foil over the top of the baking dish before you put it in the oven. Step 5 – Bake. Bake in the oven for 25-30 minutes at 400 degrees covered in foil, then remove the foil and bake for an additional 5-10 minutes. While the chicken is baking in the oven, you’ll need to whip up the Tequila Lime Honey Glaze (scroll down for instructions). Total bake time at 400 degrees is between 30 and 40 minutes – depending upon the size of your chicken breasts and your oven temperature tolerances. If you are ever “not sure”, simply cut open a piece of chicken to check for done-ness. Cook longer as needed. Step 6 – Quick Broil. To make the bacon a bit crispier on the outside, broil for 2 minutes on each side. Be careful not to overcook. Step 7 – Assemble. 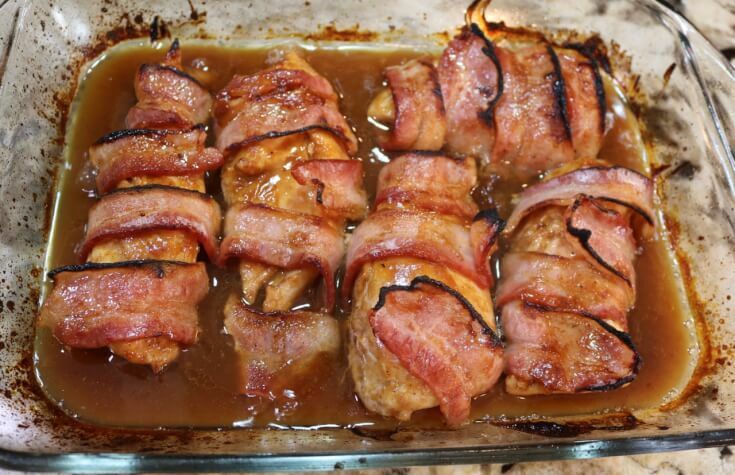 Remove the bacon-wrapped chicken from the oven and plate atop spinach leaves and rice. Or pair with vegetables of your choice. Step 8 – Glaze. 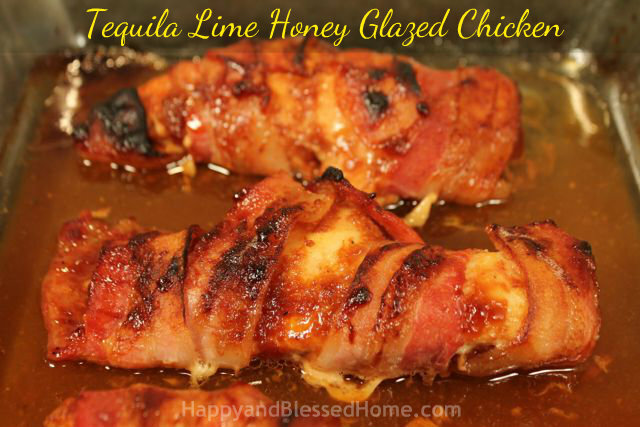 Glaze with Tequila Lime Honey Glaze and serve. 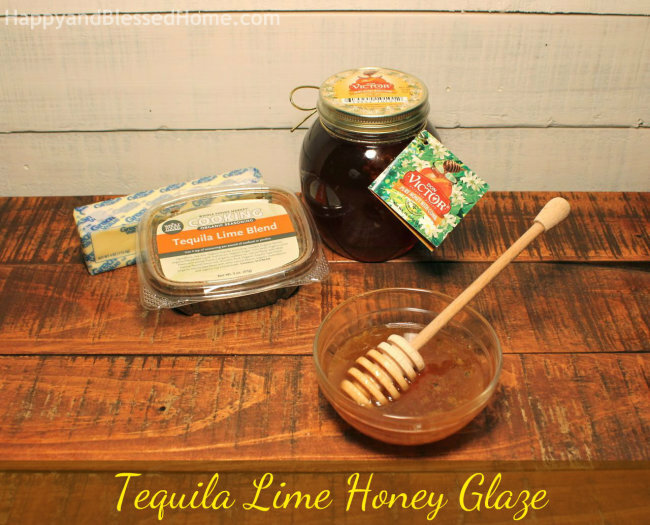 Instructions on creating the Tequila Lime Honey Glaze below. The glaze is very easy to make if you have the right ingredients. Heat a frying pan to a medium heat, and brown the butter until golden brown. Pour in the Don Victor honey, and a piece of the honeycomb, and stir until melted and mixed with the butter. Add the Tequila Lime Blend (found at gourmet specialty retail stores) and stir for five minutes. You can adjust this glaze to taste. Add more Tequila Lime Blend for a more savory flavor; and add more Don Victor honey for a sweeter flavor. 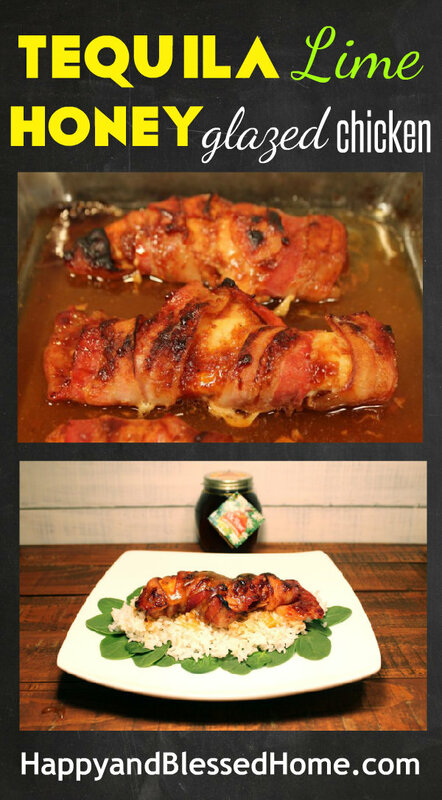 Wait until the mixture cools and thickens, and then use it to glaze the bacon-wrapped chicken. It’s crispy, tangy, sweet, and oh-so-tender. It’s a perfect and easy recipe to serve when you’re craving a chicken meal any day of the week. 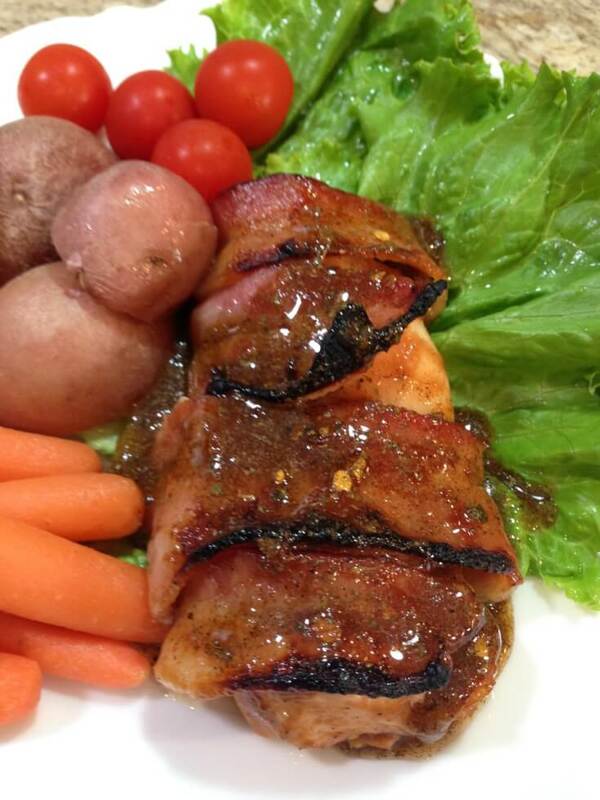 A mouthwatering take on bacon-wrapped chicken, this Tequila Lime Honey Glazed Chicken melts in your mouth. Preheat Oven to 400 degrees. I use a convection oven so it automatically adjusts downward by 25 degrees. Once it's heated it shows 375 degrees. I poured 1 tablespoon of cooking oil into my glass baking dish to prevent the bacon from sticking. Prepare. Trim all fat off the chicken breasts and cut the breast into two pieces longways. It makes for the longest split down the center of the breast. Soak. Coat chicken breasts in BBQ sauce. Season. 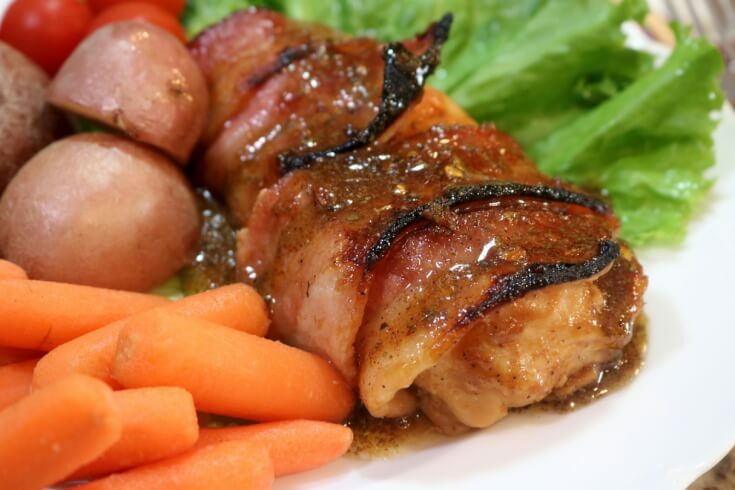 Wrap up to two slices of bacon around each chicken breast half. Sprinkle wrapped chicken breasts with garlic salt. By slathering on the BBQ sauce and wrapping it in bacon you are creating a seal around the chicken that will ensure it doesn't dry out. Just to be sure you get extra tender, juicy chicken, wrap a piece of aluminum foil over the top of the baking dish before you put it in the oven. Bake. Bake in the oven for 25-30 minutes at 400 degrees covered in foil, then remove the foil and bake for an additional 5-10 minutes. While the chicken is baking in the oven, you'll need to whip up the Tequila Lime Honey Glaze (scroll down for instructions). Total bake time at 400 degrees is between 30 and 40 minutes - depending upon the size of your chicken breasts and your oven temperature tolerances. If you are ever "not sure", simply cut open a piece of chicken to check for done-ness. Cook longer as needed. Quick Broil. To make the bacon a bit crispier on the outside, broil for 2 minutes on each side. Be careful not to overcook. Assemble. 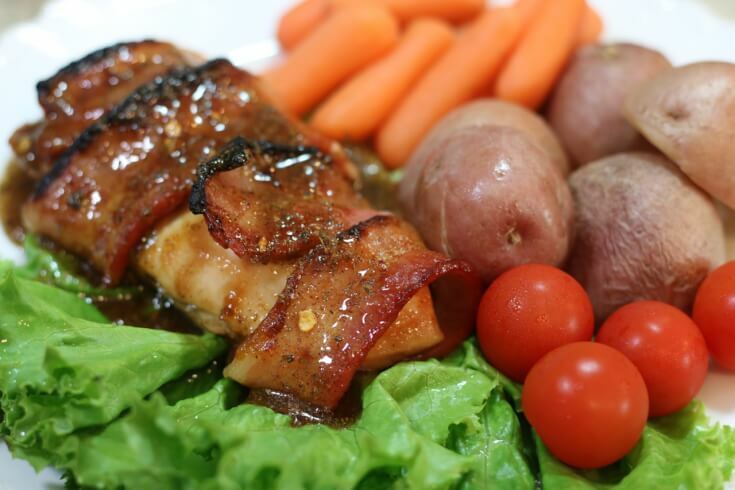 Remove the bacon-wrapped chicken from the oven and plate atop spinach leaves and rice. Or pair with vegetables of your choice. Glaze. Glaze with Tequila Lime Honey Glaze and serve. 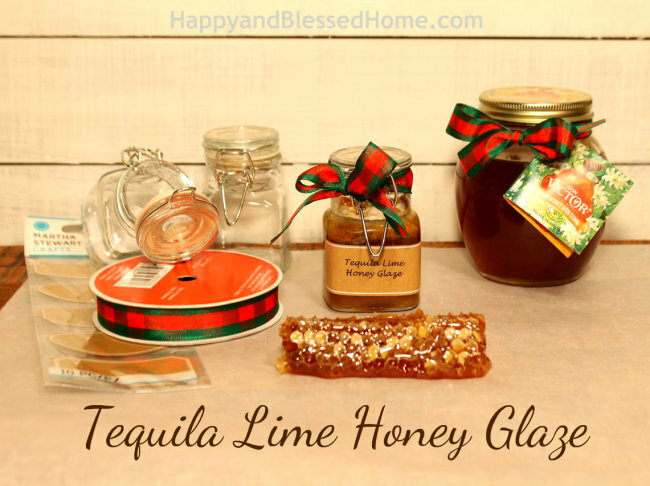 Instructions on creating the Tequila Lime Honey Glaze below. Glaze Recipe. The glaze is very easy to make if you have the right ingredients. 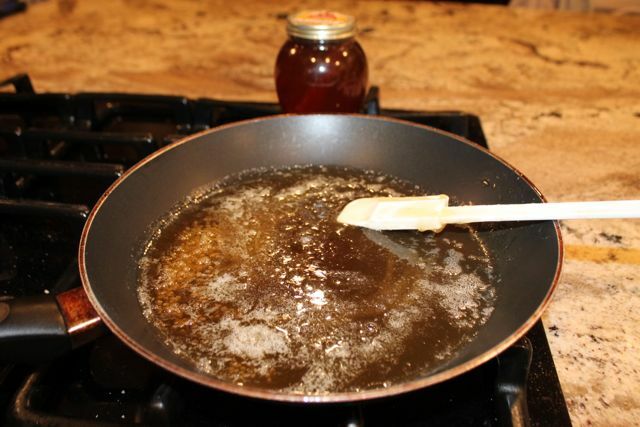 Heat a frying pan to a medium heat, and brown the butter until golden brown. Pour in the Don Victor honey, and a piece of the honeycomb, and stir until melted and mixed with the butter. Add the Tequila Lime Blend (found at gourmet specialty retail stores) and stir for five minutes. If you like to make memorable homemade edible gifts to give for the holidays, you can quickly transform this Tequila Lime Honey Glaze into a Christmas gift. I found these small glass jars with lids, labels, and ribbon at my local craft store. They transformed my secret sauce into a savory gift for Christmas. Here you can also see the honeycomb that comes inside the Don Victor honey jar. 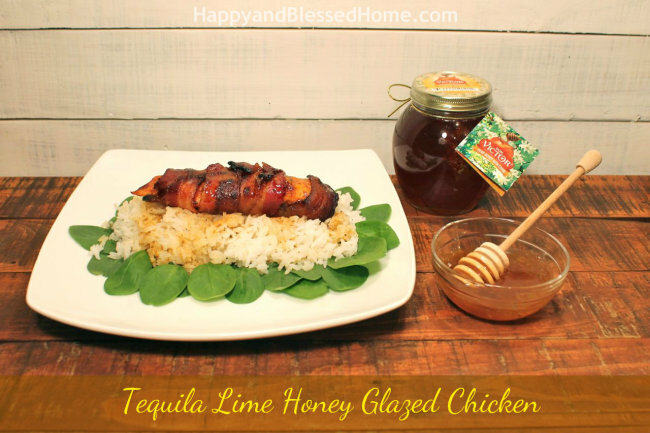 So now you have Tequila Lime Honey Glaze to eat and some to share. What could be better? How about even more yummy honey to choose from? 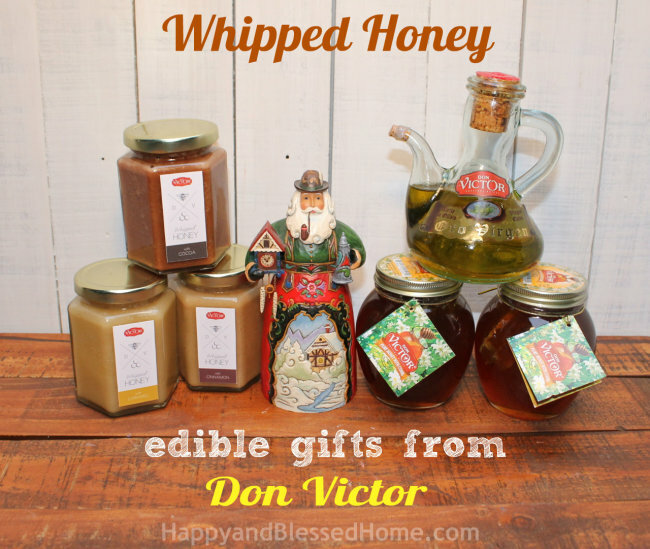 Don Victor makes whipped honey with flavors like honey and cocoa, honey and carmel, and honey and cinnamon. Also pictured here is Don Victor’s extra virgin olive oil. Learn more about the entire line of Don Victor products on their Facebook Page and the Don Victor website. I love to give and receive gifts of food for the holidays – what a wonderful way to spread a little Christmas cheer – edible gifts! What are some of your favorite edible gifts to give or receive? Please leave a comment below – I love hearing from my readers!